If you’re looking to relax on some of the best beaches on the planet, look no further than Central West Florida. Here, you’ll find seemingly endless stretches of pristine white sand, aquamarine water, and one of the most diverse eco-systems in the region. It doesn't matter if you're a fan of searching for shells or surfing, there is something for you on the beaches of Central West Florida. With temperatures that remain around 75℉ during all seasons, Florida is truly a tropical paradise. The high percentage of quartz in the sand makes it comfortable for laying out in the sun and provides a picturesque contrast to the water and wilderness. ResortsandLodges.com took all the “hard work” of finding good beaches and put together this list of some of the best beaches to check out during your stay. Clearwater Beach is not only one of the best beaches in America, the surrounding community is filled with a vast amount of fun activities to enjoy. The city of Clearwater Beach is a long and narrow barrier island with 2.5 miles of beaches. The main Clearwater Beach is conveniently located next to most of the major waterfront resorts in the area. This beach is great for couples, families, and groups. There are a wide range of facilities that will accommodate almost any need you may have at the beach. You’ll appreciate the beach showers for a quick rinse, full bathrooms close to all the action, beach furniture and umbrella rentals at various locations, and cabanas so larger groups can relax in the shade. Close by you’ll find Pier 60 where you can go fishing and rent or buy any equipment you may need for your fishing excursion. You’ll find concessions in multiple locations at the beach as well as the opportunity to head into the nearby city for a delicious meal at one of the many restaurants. Clearwater Beach embodies the perfect mix of a pristine beach with a vibrant and activity filled city atmosphere. Pass-A-Grille Beach, at the southernmost point of St. Pete Beach, embodies everyone's ideal view of the beach, with sugary white sand, turquoise water, and ever present sunshine. The beach is close to the Pass-A-Grille Historic District and the Gulf Beaches Historical Museum. The area is a hot bed for water sports, you’ll see many people parasailing across the water, taking a leisurely stroll on a stand up paddle board, or diving to see what treasures the Gulf of Mexico is hiding. You can go on a guided kayaking adventure or brave the open sea on a deep sea fishing excursion. This is an ideal location for relaxing in the sun because St. Petersburg averages an astounding 361 days of sun per year. There is ample parking close to the beach and full list of beach amenities. From concessions to restrooms, you’ll be covered at Pass-A-Grille Beach. Come for the sun and sand, then stay for the restaurants, shops, and live entertainment at Pass-A-Grille. Fort De Soto Park is not only the home to over three miles of pristine beaches, but it also contains a diverse selection of wildlife and lush vegetation. The park covers a sprawling 1,136 acres over five different islands. 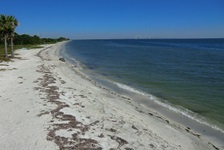 Families looking for a great beach location full of activities will find Fort De Soto Park to be an ideal location. There are multiple playgrounds and one is even modeled after a large pirate ship. Lifeguards are on duty at two different swimming areas that even have concession stands. If you want to camp out, you can make use of the camp area that has over 230 different sites. Boaters and fishermen will love the 800 foot long boat launching facility that has 11 different floating docks. The park and beach are great for gathering and reunions with 15 different picnic shelters that are available for rent. Fans of hiking and biking will enjoy making use of the over seven miles of scenic trails that wind through the islands. Last, but not least, don't forget to visit the Historic Fort De Soto and the museum within. With so much to do, this is not only a great location for a day trip to the beach, but for an entire vacation in Central West Florida. Just a short drive from Sarasota you’ll find the cool white sands of Siesta Beach on Siesta Key. The sand here is cool because it is comprised of 99% quartz, which does not hold the heat of the sun well. 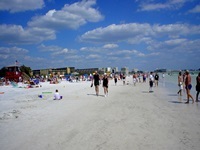 Siesta Beach is the largest and most popular beach on the island. The beach and island attract activity seekers such as kite surfers, snorkelers, bikers, and joggers. Next to the beach there are 10 different volleyball courts and 4 different tennis courts. This is the perfect beach for swimming because the water stays shallow well out into the gulf, preventing large waves from forming. In addition there are lifeguards and beach patrols constantly roaming the area. When you are ready for a meal and some shade, head for the full-service concessions area where you can enjoy a quick bite. You’ll also find popular beach amenities such as outdoor showers to get rid of sand and salt, full restrooms with changing areas, picnic tables to enjoy a meal or to rest, and even an area to rent equipment. There are many resorts and rentals near the beach for your convenience as well as boutique shopping, dining, and live entertainment on the island. 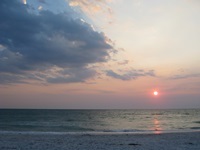 A visit to Siesta Beach on Siesta Key will deliver on your ideal beach getaway. 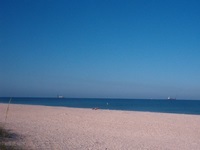 Nokomis Beach is the oldest beach in Sarasota County and resides on the picturesque Casey Key. It covers over 20 acres of white sands and lush wilderness. Nokomis is the perfect beach if you're looking for a quiet and low key location to enjoy the beach and the activities of the park. Some of the activities include kayaking along the shore for a unique view of the lush island, walking the trails that meander through the park and swimming in the azure waters for which the Gulf of Mexico is famous. The park is good for families because there are playgrounds, lifeguards on duty year round, and plenty of room to run around and have great time. Larger groups will enjoy using the large community room and the abundance of tables, gazebos, and covered areas. In addition to all the other amenities, the beach has showers to rinse off after a swim, changing rooms with bathrooms, and plenty of parking. After all the fun, stop by the concessions stand for a meal and a drink before you continue your beach adventure. For the ultimate in secluded beaches with a laundry list of amenities, Nokomis Beach is the choice for you.